Clothes dryers evaporate the water from wet clothing by blowing hot air past them while they tumble inside a spinning drum. Heat is provided by an electrical heating element or gas burner. Some heavy garment loads can contain more than a gallon of water, which during the drying process will become airborne water vapor and leave the dryer and home through an exhaust duct (more commonly known as a dryer vent). 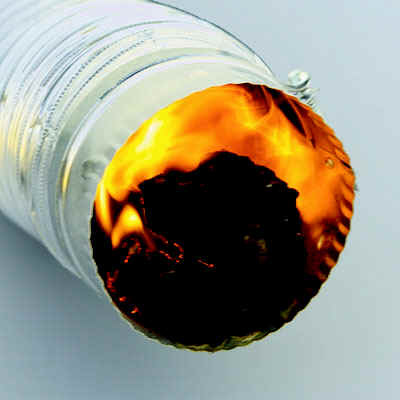 One of the reasons that restrictions are a potential fire hazard is that along with water vapor evaporated out of wet clothes, the exhaust stream carries lint – highly flammable particles of clothing made of cotton and polyester. Lint can accumulate in an exhaust duct, reducing the dryer’s ability to expel heated water vapor, which then accumulates as heat energy within the machine. As the dryer overheats, mechanical failures can trigger sparks, which can cause lint trapped in the dryer vent to burst into flames. This condition can cause the whole house to burst into flames! Fires generally originate within the dryer but spread by escaping through the ventilation duct, incinerating trapped lint and following its path into the building wall. House fires caused by dryers are far more common than generally believed, a fact that can be appreciated upon reviewing statistics from the National Fire Protection Agency. Fires caused by dryers in 2005 were responsible for approximately 13,775 house fires, 418 injuries, 15 deaths, and $196 million in property damage (in the U.S). Most of these incidents occur in residences and are the result of improper lint cleanup and maintenance. Fortunately, these fires are very easy to prevent. Exhaust ducts shall be constructed of minimum 0.016-inch-thick (0.4 mm) rigid metal ducts, having smooth interior surfaces with joints running in the direction of air flow. 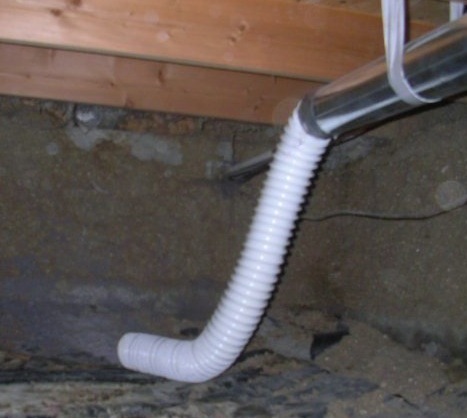 Exhaust ducts shall not be connected with sheet-metal screws or fastening means which extend into the duct. The maximum length of a clothes dryer exhaust duct shall not exceed 25 feet (7620 mm) from the dryer location to the wall or roof termination. The maximum length of the duct shall be reduced 2.5 feet (762 mm) for each 45-degree (0.8 rad) bend and 5 feet (1524 mm) for each 90-degree (1.6 rad) bend. The maximum length of the exhaust duct does not include the transition duct. This means that vents should also be as straight as possible and cannot be longer than 25 feet. Any 90° turns in the vent reduce this 25-foot number by 5 feet since these turns restrict airflow. In general, a home inspector will not know specific manufacturer’s recommendations or local applicable codes and will no be able to confirm the dryer vent’s compliance to them, but will be able to point out issues that may need to be corrected. We verify the dryer vent connections and recommend improvements as needed, such as rigid, smooth walled venting materials.